The Smithwick Floating Rattlin' Rogue is truly a classic! 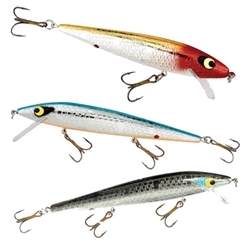 The Rattlin' Rogue has a loud rattle to "call" fish and moves with the rolling side-to-side motion of a wounded baitfish. Cast or trolled, Rattlin' Rogues draw the attention of bass, walleyes, stripers, and trout. The Chrome/Black Back color was a 2005 Bassmaster Classic Winner! This bait measures in at 4-1/2", 1/3oz, #6 hooks, and dives a depth of either 0-2ft or 0-4ft.